This is. Great statement piece. It is a tad more gold than I thought, but it does have some bronze tones. Looks great! Add a burst of beauty and sophistication with a Safavieh ShaniraSunburst Gold Mirror. With its gorgeous, gold-finished iron raysand round mirror frame, this mirror is reminiscent of the sun andadds texture and depth to the room. 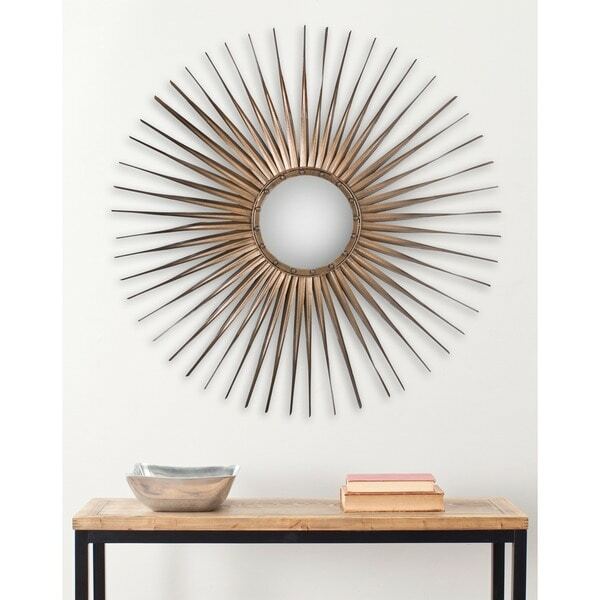 Place this sunburst mirror inyour living room to spark a lively conversation. This gorgeous mirror adds depth and texture to any room, andthe gold frame matches virtually any decor and style. Display thesunburst frame prominently on your living room wall, and use thismirror as an eye-catching conversation starter for guests. Contrastthis mirror against a dark backdrop to make the gold color reallypop. Dimensions 33.5 in. H. x 33.5 in. W. x 1 in D.
Color of mirror metal frame is not Gold as stated or shown. The color is a dark bronze. Returned mirror since I needed the gold color. 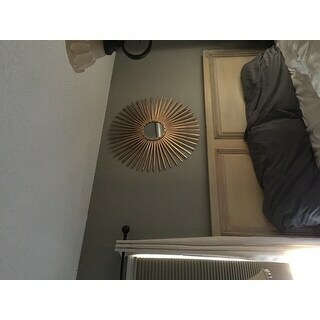 If you are looking for a sunburst mirror with lots of style, for a low low price, this is a great deal. The quality is as expected for the price. It's not the sturdiest thing, but it doesn't need to be in order to hang on the wall. A very good deal. I read all the reviews and was concerned initially about the color of the mirror. Mine turned out to be more of a bronze-gold, rather than a gold- bronze. Since I've decided to use mixed metals in our new condo, this wasn't my biggest concern. However, I did want a statement piece that would fill up a wall. The Sunburst mirror certainly fit the bill! It's stunning and we love it. It's sure to elicit positive comments from everyone who sees it! Great purchase at an affordable price. I've purchased several Safavieh items to include a leather cocktail ottoman and an entry bench. I'm never disappointed with the quality of their merchandise. The sun rays are a not structural, so be careful while handling it to hang it. Once it's up - wow! It really makes the room. I recommend this mirror to anyone going for an mcm feel. I really love this mirror. Before purchasing, I read mixed reviews on the color - on it being more bronze than gold but mine is more gold than bronze, which is perfect! I mounted it in the spare bedroom and it really brightens it up and makes it a very happy room. It is a little awkward to pick up but very light weight and easy to mount. It's a bit more bronze than gold, but looks beautiful in our dining room. Looks elegant on my living room wall! I like the color & texture of the mirror. It looks great on the navy wall. Exactly what i was looking for! This Starburst really added the pop I wanted for this bedroom. So pretty. The Gold Color is gorgeous. This is a beautiful gold mirror. I needed something to "pop" on my vaulted ceiling wall because it extends so high. this did it. It looks lovely high above my window and gives my dining area a spectacular look. Such a grand piece. I looked everywhere and found it here! It is exactly like they say and is very big and beautiful. Beautiful sunburst mirror. It is more brass than gold and looks great with my West Elm bedroom furniture - the dressers have brass knobs. very good quality. good purchase.. item as seen in the picture. Purchased for my bedroom which is painted with dark blue/gray walls. The gold really pops with this color and just makes a real statement. It arrived in wonderfully protective packaging. Would definitely purchase again and highly recommend if you're waffling. This is a really nice mirror. I bought it for my foyer but then it wasn't the right look. Although stunning, I did return it for a different item. What may not have worked in my home, may very work in yours as it is really beautiful. Great mirror at a great price. This is really pretty, a nice architectural piece. It was a little tough to hang but well worth it in the end. Client really liked it too. I have it hanging over my bed, it’s very attractive and looks more expensive than it was. I gave this as a gift. She loves it. "What is the dimension of the actual mirror? not just the overall piece." Hi, Sorry it took so long, but I have it on top of the highest part of my vaulted ceiling wall.....The actual mirror size is 8 inches round. Hope this helps. Great for over a bed!